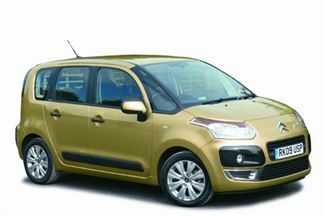 The C3 Picasso sets out to create something that offers practicality on the inside with an individual image and funky styling on the outside. The styling certainly sets it apart from anything else this size while its clever use of space and excellent visibility give it an edge over alternatives like the Nissan Note and Vauxhall Meriva. The C3 Picasso sets out to create something that offers practicality on the inside with an individual image and funky styling on the outside. The styling certainly sets it apart from anything else this size while its clever use of space and excellent visibility give it an edge over alternatives like the Nissan Note and Vauxhall Meriva. Drive wise it is rather dull and some engines are sluggish, but what it lacks in power and excitement it makes up for in its functional use of space and size. Plenty of rear passenger space and a large boot make it ideal as a family car. In 2013 a facelift was announced. There's a tweak to the HDi 110 engine meaning more power with the same fuel economy and emissions, while some kit was added to some of the trims and there are a few more optional extras too.